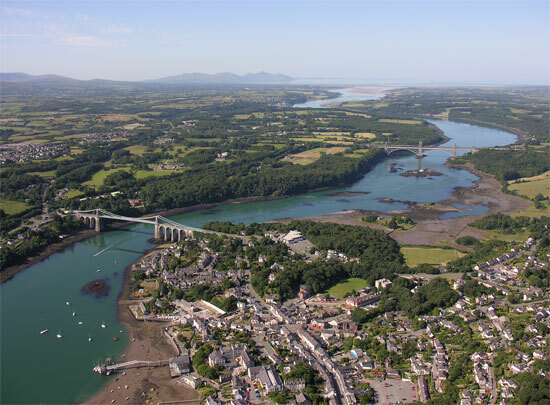 The Menai Straits between the island of Anglesey and the mainland of North West Wales has been both an obstacle and a means of communication for thousands of years. The Menai, with its extreme tidal range has also been a source of power and a source of food, with many shoreline fish-traps in evidence. This project considered the operation of the ferries over a period of 800 years and attempted to identify the location and the archaeological evidence of their use. The project also considered the surviving archaeological evidence for certain infrastructural elements of Bridge building at Menai Bridge and Llanfairpwll. The changing requirements of land-based travel necessitated changes in the way in which the ferries operated. Road improvements in the eighteenth century and an increase in coach traffic determined a re-orientation in the volume of traffic along certain reaches of the Straits. Bridge building at Porthaethwy in the 1820s rendered that ferry redundant and hastened the demise of the Beaumaris ferry. The ferries at Talyfoel, Moel y Don and Garth , on the other hand, continued to operate into the second half of the twentieth century. While ad hoc crossing of the Straits must always have taken place, by the thirteenth century at least, and presumably earlier, the provision of ferry services was regularised and controlled. Six principal ferries were in operation, under the control of major landed interests which included the Welsh Princes and, subsequently, the English Crown, the Bishop of Bangor and private estates such as the extensive lordship of Porthamel. The ferries operated within defined and jealously guarded waters . • The Llanfaes (later Beaumaris) ferry, took passengers who had crossed the Lavan Sands, into Beaumaris. The Llanfaes ferry is attested in documentary sources from 1292, nine years after the conquest of Gwynedd. At that time five ferrymen worked the ferry at their own expense as part of the commuted rent they paid for the tenements they held. The king paid the cost of providing the boat and it seems clear that these ferrymen were tied estate workers, albeit specialised, on the demesne of the former Prince. • The Porthesgob ferry plied the waters between Cadnant, Porthaethwy and Gallows Point, Beaumaris from its wharves at Gorad y Git and Garth Point, Bangor. This ferry, as the name implies, was in the hands of the bishop of Bangor. Reference is made to the Bishop’s ferry in the earliest Anglesey Sheriff’s accounts of 1292. • The Porthaethwy ferry ran two ancient routes between Carreg yr Halen, Porthaethwy and Treborth Mill and the main Porthaethwy landing stage to the adjacent mainland shore. Porthaethwy is first referred to in 1193. The Welsh Prince and the free tenants of Porthaethwy, both, shared a half interest in the ferry. Much later a third route brought coaching traffic from the George Hotel on the mainland to Porth y Wrach, Porthaethwy. • The Abermenai ferry crossed from the tip of the Abermenai sandbar to Belan, at the north end of Morfa Dinlle, the promontory formed by the estuary of the Gwyrfai. Abermenai probably has a claim to be the earliest documented ferry on the Straits. The Welsh Life of Gruffudd ap Cynan, king of Gwynedd in the late eleventh and early twelfth century, mentions Abermenai no less than six times. Abermenai ferry remained in the hands of the Welsh Princes and continued to be Crown property after the Conquest. • and, lastly, the Talyfoel ferry, working out of the Caernarfon quays to the Anglesey shore, opposite, and later re-established a little to the east at Y Foel. Talyfoel was a Johnny-come-lately on the Straits and was not firmly established until the fifteenth century. Porthaethwy had long been an important ferry. The poor state of roads in north west Wales had been an obstacle in an age of increasing use of wheeled vehicles during the eighteenth century. In 1817, Telford, who was already working on an associated project, the engineering of the post-road from London to Holyhead, submitted an adventurous design for a suspension bridge at Porthaethwy. The design was accepted and the bridge was opened in January 1826. The expansion of the rail network during the second quarter of the nineteenth century required that a good line of railway communication between London and Holyhead be established. A second bridge across the Straits was necessary and Robert Stephenson, son of the railway engineer George Stephenson, was commissioned to design a solution. Stephenson’s tubular design was as revolutionary and imaginative as Telford’s suspension bridge, a generation earlier. These two bridges were engineering achievements of international significance. Several features relating to the approach roads, quays, ferry houses, inns and coaching stables of the ferries survive, as do the infrastructural elements of bridge-building - quays, stables, lime kilns, horse railways and the platforms of offices and workshops. These have been catalogued in the report with recommendations for further detailed recording.